Do you have more beets than you know what to do with? 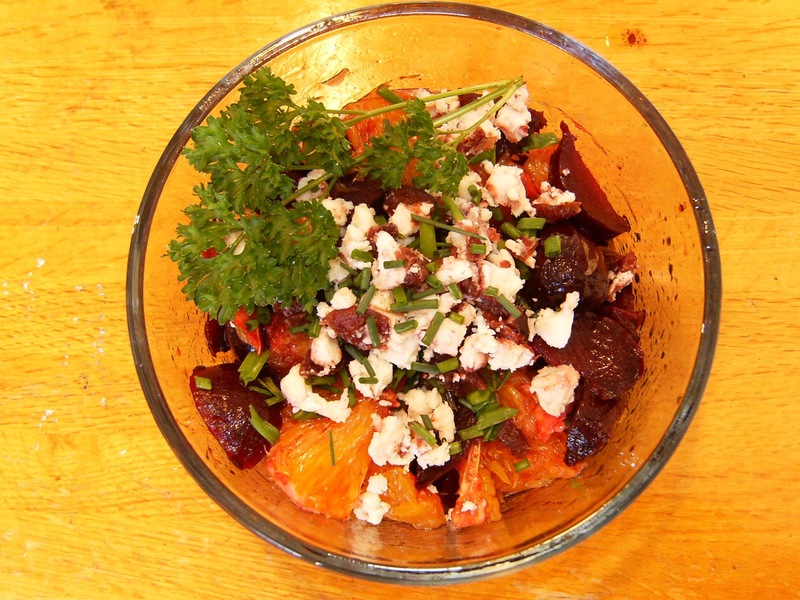 Why not make orange and beet salad? Pierce washed beets and roast in the oven for 45 min - 1 hour, until soft. Cool, peel off skin and cut into chunks. Mix with orange pieces, goat cheese, chives and parsley. Mix oil, honey, cinnamon and balsamic vinegar and add to salad. I got it at Blacks about 2 1/2 years ago for about $200.00. One of the settings on the camera is a food setting which works well for me. I do find it hard to take nice pictures indoors since I cook at night and by the time I get around to capturing a photo all the natural light is gone. I really enjoy your blog and think it's fantastic that you work on a farm! I look forward to more posts so I can live vicariously through your farm experiences. Thanks for stopping by Caitlin! Did you make the connection that I work on THE farm from which you get your CSA box? PS I am even more impressed by your photos now that I see you have a fairly regular camera. Amazing!